This article is about the city. For United States military base, see Bagram Airfield. For the village in Iran, see Bagram, Iran. Bagram (/bəɡrɑːm/) (Persian: بگرام‎) is a town and seat in Bagram District in Parwan Province of Afghanistan, about 25 kilometers north of the capital Kabul. It is the site of an ancient city located at the junction of the Ghorband and Panjshir Valley, near today's city of Charikar, Afghanistan. The location of this historical town made it a key passage from Ancient India along the Silk Road, leading westwards through the mountains towards Bamiyan, and north over the Kushan Pass to the Baghlan Valley and, past the impressive statement of Kushan power at Surkh Kotal, to the great commercial centre of Balkh and the rest of northern Afghanistan. The origin of the name Bagram is not clear, with several theories proposed to describe its origins. Kapisa, an ancient site near the town is known to be the location of a city once ruled by the Indo-Iranian Kamboja dynasty. 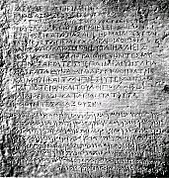 Bilingual edict (Greek and Aramaic) by Emperor Ashoka, from Kandahar - Afghan National Museum. (Click image for translation). While the Diadochi were warring amongst themselves, the Mauryan Empire was developing in the northern part of the Indian subcontinent. The founder of the empire, Chandragupta Maurya, confronted a Macedonian invasion force led by Seleucus I in 305 BC and following a brief conflict, an agreement was reached as Seleucus ceded Gandhara and Arachosia (centered on ancient Kandahar) and areas south of Bagram (corresponding to the extreme south-east of modern Afghanistan) to the Mauryans. During the 120 years of the Mauryans in southern Afghanistan, Buddhism was introduced and eventually become a major religion alongside Zoroastrianism and local pagan beliefs. The ancient Grand Trunk Road was built linking what is now Kabul to various cities in the Punjab and the Gangetic Plain. Commerce, art, and architecture (seen especially in the construction of stupas) developed during this period. It reached its high point under Emperor Ashoka whose edicts, roads, and rest stops were found throughout the subcontinent. Although the vast majority of them throughout the subcontinent were written in Prakrit, Afghanistan is notable for the inclusion of 2 Greek and Aramaic ones alongside the court language of the Mauryans. The last ruler in the region was probably Subhagasena (Sophagasenus). Bagram became the capital of the Kushan Empire in the 1st century, from here they invaded and conquered Peshawar in the south. The "Bagram treasure" as it has been called, is indicative of intense commercial exchanges between all the cultural centers of the classical time, with the Kushan empire at the junction of the land and sea trade between the east and west. However, the works of art found in Bagram are either quite purely Hellenistic, Roman, Chinese or Indian, with only little indications of the cultural syncretism found in Greco-Buddhist art. The Islamic conquest of Afghanistan and the adjoining Pashtun region began in 7th century after conquest of Persia. However, the complete Islamization of Afghanistan wasn't achieved until the Ghaznavid rule. The modern-day town is believed to be founded by Babur at the site of the ancient city. Bagram hosts the strategic Bagram Airfield, from which most US air activity in Afghanistan takes place. The runway was built in 1976, and it was a Soviet air base from 1979 to 1989. There is also a Provincial Reconstruction Team which is led by the US. Bagram is also the location of the Parwan Detention Facility; this detention facility was the last prison in Afghanistan under management of the US. It was handed back to the Afghan government on 25 March 2013. The detention centre had earlier come into the attention of the news media as it was claimed that prisoners were tortured (see the article Bagram torture and prisoner abuse). At the time of the hand-over of the facility, human-rights groups like Amnesty International have raised concerns about the treatment of prisoners there. On December 21, 2015, Bagram was the site of a suicide bombing killing 6 people. ^ Afghanistan News. Information Bureau, Royal Afghan Embassy. 1960. ^ Bhattacharya, Avijeet. Journeys on the Silk Road Through Ages. Zorba. p. 192. Retrieved 19 January 2018. ^ Popalzai, Masoud; Starr, Barbara. "6 U.S. troops killed in motorcycle bomb attack in Afghanistan, officials say". CNN. Retrieved 21 December 2015. The Ancient Geography of India. I. The Buddhist Period, Including the Campaigns of Alexander, and the Travels of Hwen-Thsang. Alexander Cunningham. Trübner and Co., London. Complete and unabridged reprint (2006): Low Price Publications, Delhi. Wikimedia Commons has media related to Bagram. Wikivoyage has a travel guide for Bagram.